A sense of community (concerts, events, and festivals) ~ parks, recreational facilities, golf courses, greenway and river walk ~ a thriving arts community ~ close proximity to RDU International Airport and the RTP ~ nightlife and entertainment options ~ unique local restaurants and retail shops ~ budget-friendly housing options ~ quality education options ~ state-of-the-art health care facilities ~ a local farmer's market ~ and so much more. 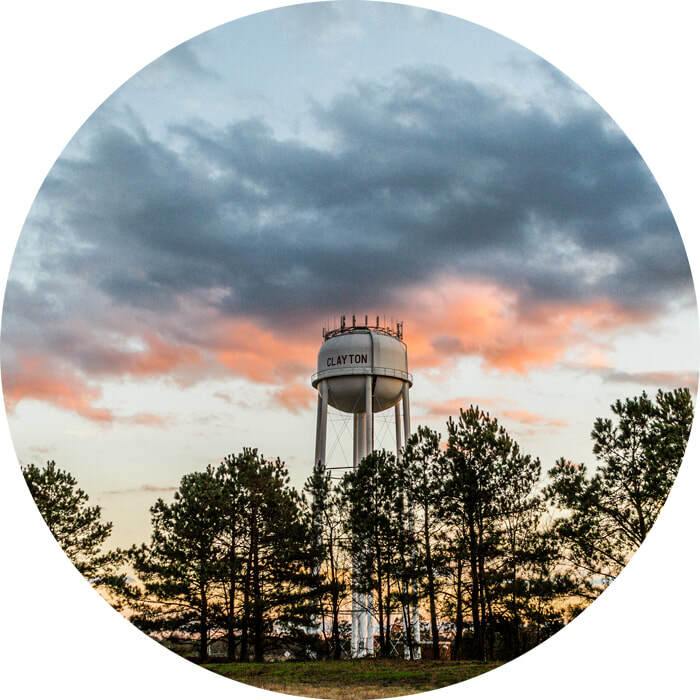 Located just outside of Raleigh, North Carolina and the Research Triangle Park (RTP), Clayton is the largest town in Johnston County with a population just over 20,000 (2016 U.S. Census estimate). According to North Carolina's Office of Budget and Management, Johnston County is currently projected to be the fastest-growing county in North Carolina over the next ten years. Below is a glimpse of the beauty and charm the Town of Clayton has to offer. A true gem in North Carolina. Clayton is only about a 25-minute drive to the state capital in Raleigh and about a 35- or 40-minute drive to the RTP. Clayton is near Interstates 40 and 95 and U.S. 70, and is a 35-40 minute drive from Raleigh-Durham International Airport (RDU). RDU services nine major airlines and flying to 50 nonstop destinations on 400+ daily flights. Affordable housing options, great schools, and diverse arts and recreation options make Clayton the perfect place to live if you are looking to work within one of Clayton's own expanding business sectors (manufacturing, bio-pharmaceutical, health care, etc.). 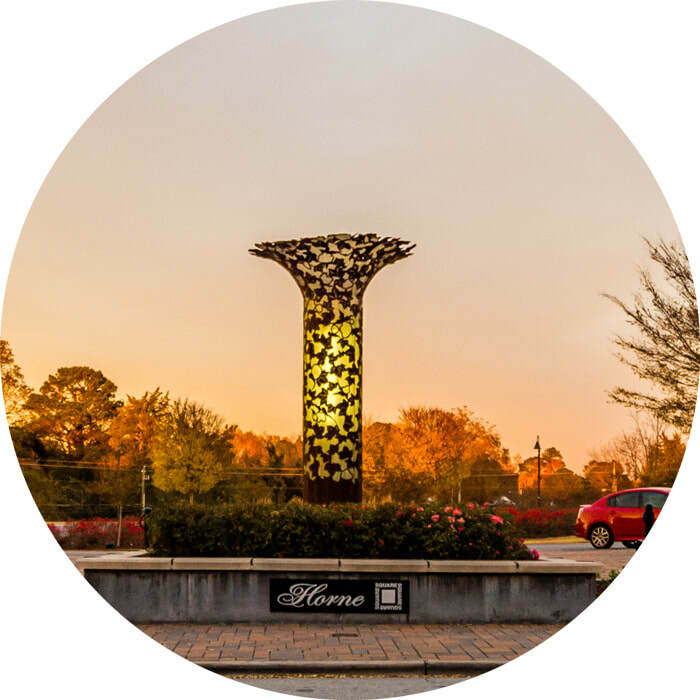 And Clayton's proximity to major highways, particularly the future Southeast Extension of the Triangle Expressway (I-540), make Clayton a first-choice commute if you plan to work in the nearby RTP area, but desire smaller town living. Clayton's best asset, however, will never show up in the numbers. What makes Clayton a true gem is its small town heart and wonderful sense of community. If you are or thinking about becoming a resident of Clayton, North Carolina, the following is a list of helpful resources. Click on the (+) next to each category to read more. Visit the Clayton Business Guide for more information about doing business in Clayton. Clayton is a burgeoning artists’ community. The visual and performing arts continue to grow as citizens find more reasons to stay in town for entertainment. The Clayton Center, which features a 600-seat auditorium, was renovated from the former Clayton school buildings into a state-of-the-art performance and conference center. The auditorium is home to a professional performance series that runs between October and May annually. The center has hosted performances by entertainers such as Kathy Mattea and Doc Watson. 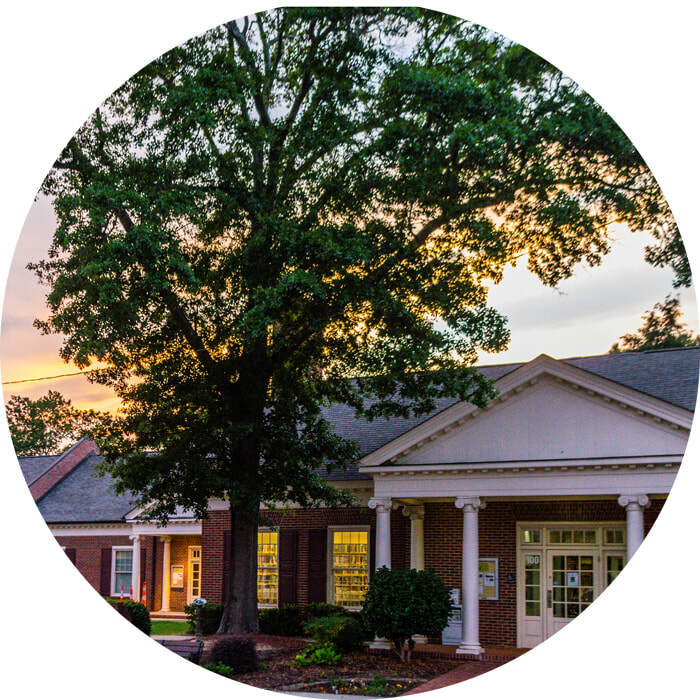 The conference center has quickly become a destination for both the businesses and civic communities around the region, playing host to a broad spectrum of events from weddings to expos to homeowner’s association meetings and religious services. The auditorium is also rented to local groups for pageants, concerts and presentations. The Conference Center is a destination for both the businesses and civic communities around the region. It’s also home to visual artist exhibitions throughout the year. For more information, visit www.theclaytoncenter.com. 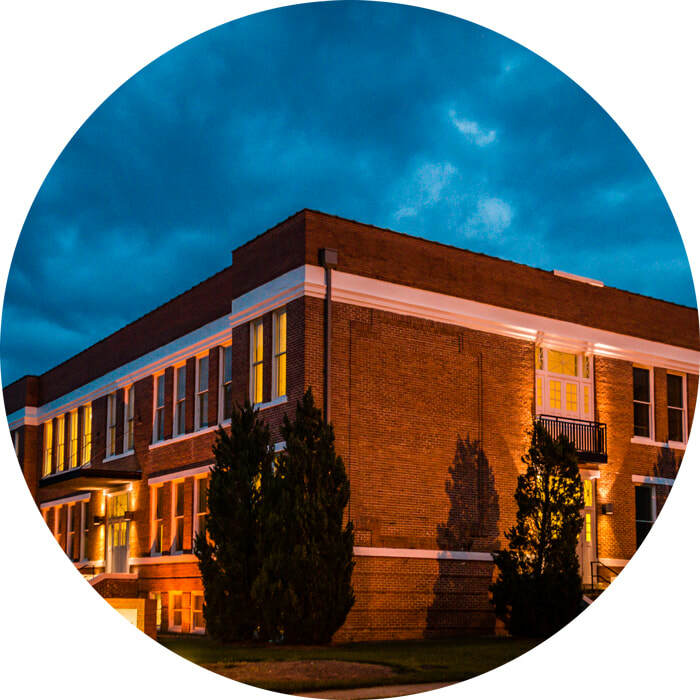 Clayton Visual Arts is a private, nonprofit arts agency for Clayton. The council supports quality arts programs and projects throughout the county and within area schools, promotes and sponsors local arts events, and advocates the arts as a part of everyday life in Clayton. For more information, visit CVA's website at www.claytonvisualarts.org. The Clayton Downtown Development Association sponsors the Town Square Concert Series the third Thursday of each month from May through September, featuring popular bands. Visit their website at www.downtownclayton.org. A cultural arts and music festival hosted by the Clayton Visual Arts held in Downtown Clayton NC in June each year. Visit www.mondoroots.com to learn more. Johnston County Schools is comprised of 46 schools that serve over 36,000 students from kindergarten through grade 12. The Clayton area includes: West Clayton Elementary, East Clayton Elementary, Cooper Academy, Powhatan Elementary, Riverwood Elementary and River Dell Elementary schools serving grades K-5; Clayton Middle School, Archer Lodge Middle School and Riverwood Middle School, serving grades 6-8; and Clayton High School, Corinth Holders High School and Cleveland High School, serving grades 9-12. All schools are accredited by the North Carolina Department of Public Instruction and by the Southern Association of Schools and Colleges. Clayton residents enjoy a wide range of higher educational choices. Closest to the area is the award-wining Johnston Community College in Smithfield, NC. Serving more than 15,000 students with an annual budget of $400 million, it awards associate degrees, certificates, and diplomas to students pursuing college transfer, occupational, technical, and continuing education opportunities. Clayton is also only a 30-60 minute drive to several private colleges such as Campbell University, Barton College, Shaw University, Meredith College, and North Carolina Wesleyan College, as well as internationally-recognized universities in the Research Triangle Park area such as Duke University, UNC-Chapel Hill, and North Carolina State University (NC State). In October/November, the Clayton Chamber of Commerce sponsors the Clayton Harvest Festival featuring amusements, an antique car show, BBQ competition, arts & crafts and many food vendors. You can find information here. 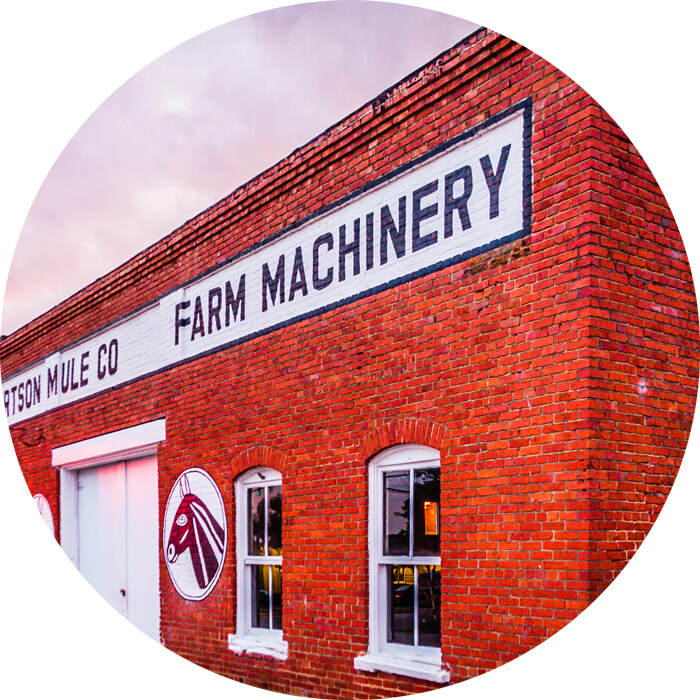 Boyette Farms offers visitors on the farm agri-tainment activities with the Clayton Fear Farm with day visits suitable for small children and the Christmas Lights on the Neuse offering hayrides among the lights down to the Neuse River. The Town of Clayton holds an annual 4th of July celebration. You can find information here. The Town of Clayton holds an annual Christmas Village and Tree Lighting. You can find information here. ​The Clayton Rotary sponsors the Clayton Christmas Parade on the second Saturday of December. You can find more information here. The Town of Clayton's website is townofclaytonnc.org. You can contact the public utilities (not applicable for Clayton's ETJ district) here. You can follow the Town Council agendas here. Clayton news issued by the Town of Clayton can be found here. If you are looking to open a business in Clayton, you can contact Clayton's Economic Development department here. The Clayton Police Department web page can be found here. The fire department web page is here. The Mountains-To-Sea Trail is a statewide project that, when completed, will be a 1,000-mile trail from Clingmans Dome in the Great Smokey mountains to Jockey’s Ridge on the Outer Banks of North Carolina. Sam’s Branch Greenway is a 1.5-mile paved trail accessible by a trailhead located on O’Neil Street. 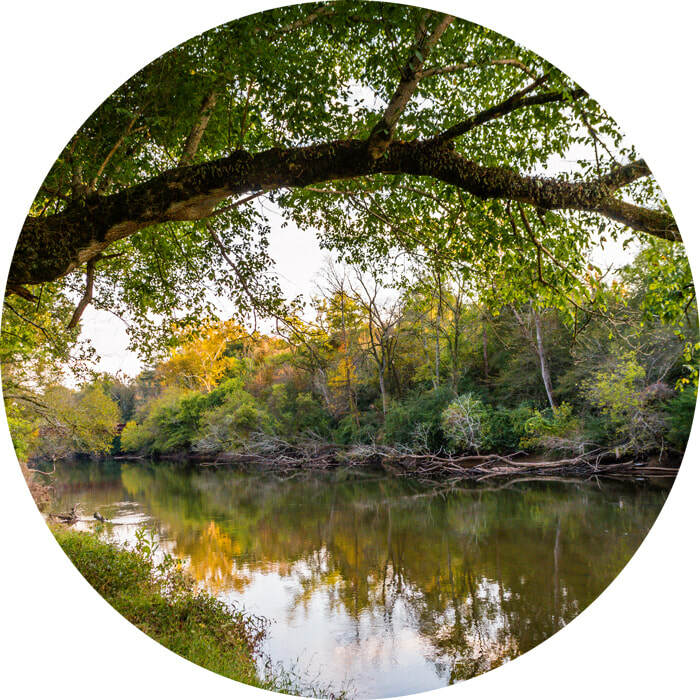 The Greenway Trail links Clayton to the Mountains-To-Sea Trail along the Neuse River. ​There’s something for everyone in Clayton. From the arts to the outdoors, the area offers activities for visitors and citizens of every age. The Clayton Parks and Recreation Department offers year-round programs for all age groups. Youth and adult athletic leagues, special events (including the annual Fourth of July celebration) and a wide variety of self-improvement classes are offered. 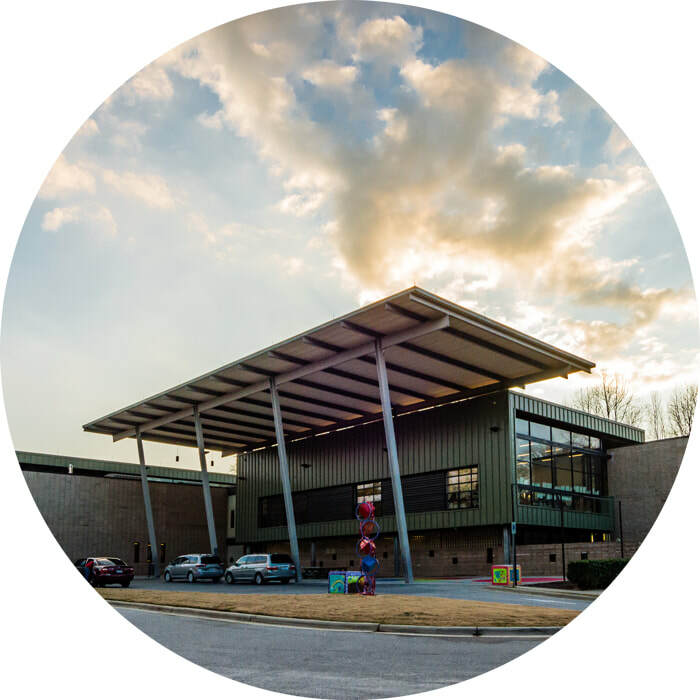 The Clayton Community Center, located at 715 Amelia Church Road, is a new 32,000-square-foot facility that offers a full-size gymnasium with basketball and volleyball programs for all age groups. Above the gym floor is a cushioned track that is available for walking or jogging any time the facility is open. Also in the center are dedicated rooms for pottery, arts and a multi-purpose floor for exercise, dance and martial arts classes. A variety of classes and camps are held in the facility throughout the year. Registration for youth and adult athletic programs are also held at the center. Parks and Recreation also maintains several public parks. Clayton Community Park on Amelia Church Road is a 42-acre park that has multiple recreation opportunities. Included are a field house, picnic area and playground, championship tennis courts, three softball and youth soccer fields and a paved trail for hiking, jogging and biking. Municipal Park on Stallings Street features a volleyball court and horseshoe pits, as well as a playground, a basketball court, a tennis court, a ball field and a picnic and shelter area. Legend Field, located on City Road, provides a baseball and softball field and a premier mountain bike trail that is popular with riders in Clayton and throughout the Triangle area. Front Street Park has a playground area and a basketball court. East Clayton Community Park is a 66-acre park on Glen Laurel Road. The park has regulation baseball and soccer fields along with a large multi-purpose field, one-mile walking trail, picnic shelter, and dog park. There will be a disc golf course and a universal playground on this site in the near future. Clemmons Educational State Forest offers educational programs, nature trails, camping, hiking and picnic facilities. The town boasts a wide variety of establishments from fine dining to catering companies to food trucks to fast food to ethnic cuisine; there is something for everyone. 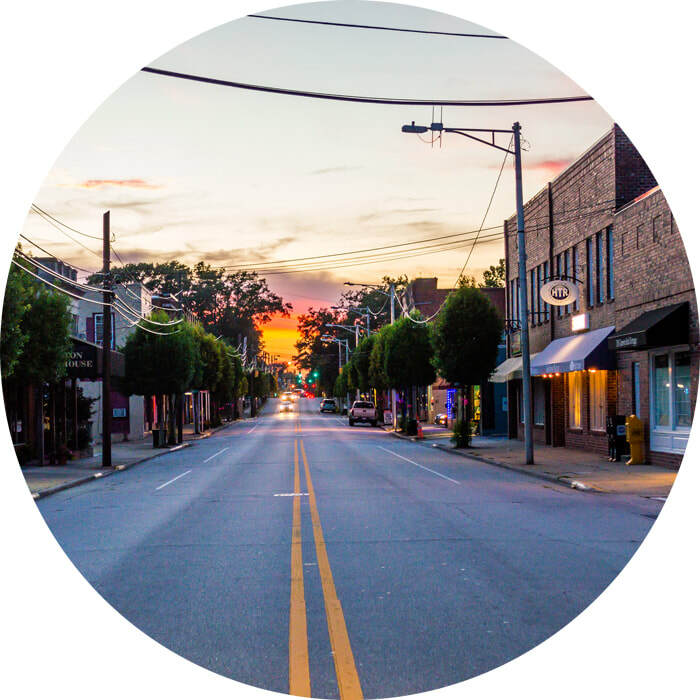 Clayton offers shoppers a wide range of retail and service centers through-out town. Along U.S. Business 70, shopping options range from large discount retailers to small specialty, jewelry and clothing shops. Hair and nail salons, day spas and other professional services are readily available. Shoppers will find new and used furniture, women’s clothing, home interiors and more tucked in the shopping centers that line the major thoroughfare. Clayton also features a vibrant downtown shopping district. Along Main Street and the surrounding streets, shoppers can find gifts, an art gallery, art frame shop, new furniture, jewelry, printing services, garden and office supplies, cake decorating and party supplies, hair and nail supplies, restaurants and professional offices. The Clayton Farm and Community Market opens seasonally April to October offering farm-fresh produce, flowers, arts & crafts, local honey and much more. The market is located on the Horne Square at the corner of Lombard and Main Street. Learn more at clayton-farmers-market.org. A brief history of Clayton. Request a newcomer packet here.